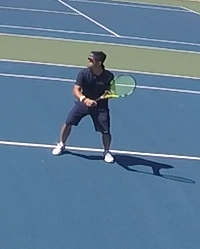 Tennis League Network Blog: Minh Ha - Found the love of tennis after his college years. Minh Ha - Found the love of tennis after his college years. We caught up with Minh Ha who plays out of the TennisMinneapolis.com St. Paul / Minneapolis tennis community. Tell us a little bit about yourself, for example: What do you do? I grew up in the Highland Park area of Saint Paul. I had a humble upbringing meaning we couldn’t afford tennis rackets. My first racket was a racket my dad had bought at the thrift store. I was a wooden racket. I played with this racket and it was my first tennis racket. I remember it was quite heavy, especially for a 10 year old kid. Then in high school my dad bought me an aluminum racket which was a step up from my wooden racket. I was never very good but gave it my best. Our school was not known for a tennis program so everyone made the team. It was only after I graduated college and had a job where I could say I can buy a racket that I truly loved. I played tennis with my college friends sometimes well past midnight under the courts with lights, but as they have family and kids they are less available these days. The tennis league have reopened the door for me to contact and play with others who share the same passion for the sport as myself and has rekindled the love of the sport I felt as a 10 year old kid who first picked up a wooden racket. My name is Minh Ha and I am a member of Tennis Minneapolis. I participated in the summer league 2017 and continued to fall, winter, then spring and summer of 2018. Minh has compiled a 38-32 record in 2 shorts years. Pretty impressive. Minh's Player Profile. I learned about the league from a fellow friend at a tennis Meetup in Minneapolis. He said it was very fun and entertaining yet challenging enough so that you can improve your game. Currently I play about 3-5 matches each week. On my off days I have been known to schedule 3 matches back to back to back. It is quite a workout. My goal this summer was to play 20 matches and I was able to play 21 matches. Minh got a free season for his effort!! There are so many things to like about this league but the thing I like most is the ease of scheduling a match and getting out and play and meet new people. The league is very flexible so that it works around my work schedule which is very hectic. I think the iPhone app is very good because it has everything I need to schedule matches, submit scores and even find out my rankings. My most memorable match was summer playoffs 2017. I have never played in a single elimination tournament in my life but my three playoff matches all went to the third set and feature some of my most intense rallies and crucial points. One match in particular that I will always remember was my semifinal match against Pooya. We had a scheduled our match at Saint Anthony High School. Just as we were warming up, it started to sprinkle and a downpour ensued. We ran to our cars and I looked at the radar to see if we could move somewhere dry. We found that Rahn Park in Eagan was dry. So we both agreed to drive to Eagan to play since it has lights. When we came there it was dry but then it started to sprinkle. We kept playing and the conditions did not worsen. We even saw a double rainbow and it did indeed turned out to be a beautiful night. I also featured 3 sets of wonderful tennis. Two of my favorite rivals in the league and Chan Kek and Nick Ngo. Both these players play a very similar style to me which is long baseline rallies and often times the margin of error is very slim. They both challenge me to keep my focus yet also elevate my play to another level. I first played with Chan in the fall playoff of 2017. It was an instant classic 3 setter that feature numerous rallies and long deuce points. I played Nick twice in the summer of 2018. The second match was an instant classic as it was a 3 setter. It was also the third match I played that day and took place in between a ominous sky that was very close to storming. We fought through each point and also the wind and sprinkles. When the last point was won each of us were drained yet appreciated the challenge our opponent gave us. It was truly a memorable night. I am known in the league as the player that records the matches with the gopro. I run into all kinds of players and oftentimes they can’t remember my name but know me as the player that records the matches. I find it very fascinating to re-watch my matches and replay the points. It is very satisfying to relive the moment and capture it for those times I cannot play tennis such as during the winter months. I started playing tennis at age 10. My dad took me out one day and we both biked to a neighborhood tennis court. I remember asking my dad what we were going to do and he said were going to hit the ball around. After the first 10 minutes I was hooked. I asked him to join me almost every single day. He could not pry me away from the hitting wall. Later as I grew older I played with my uncle every Sunday after church. We had many memorable matches at the local tennis courts. I love the fact that there is so many layers to tennis. It combines both the mental and physical aspects of the sport where it is like a physical chess match. Each time I learn something new about tennis there seems to be yet another aspect about the sport that I haven’t known before. I like that I can enjoy this sport well into my 70-80s and I can still watch these matches on tv and feel the pressure the players who are playing must be feeling. My favorite player growing up was Andre Agassi because I loved his tenacious never quit attitude. I loved his return game and his two handed backhand. Currently I love Rafa Nadal because of his tenacious take no prisoner attitude and game. I enjoy watch his endless rallies and his powerful topspin forehands and underrated two handed backhands. He reminds me a lot of my game since I favor my forehands and like to put a lot of topspin on the forehands. My other hobbies are photography, videography, photoshop and tinkering with computers and laptops. I also enjoy stringing tennis rackets for family and friends. I also like to draw and paint. This league have allowed me to do the two things I love the most, which is playing tennis and watching youtube videos of myself playing a tennis match.